A harmonica in the key of F.
A harmonica is a free reed wind instrument which has roots that may go back as far as five thousand years. The instrument is played by blowing air into or inhaling air through individual holes known as reed chambers, producing alternating and harmonizing notes. Each chamber has multiple, variable-tuned brass or bronze reeds which are secured at one end and loose on the other end, with the loose end vibrating and creating sound. The harmonica's first large-scale success came at the hands of German clock-maker Mathias Hohner, who started off making 700 instruments in his first year, in the mid nineteenth century. Within the decade, he was selling millions of units a year all across the world, but particularly in America, where the instrument found a special place among the displaced African-American blues tradition. The harmonica is used in blues and American folk music, jazz, classical music, country music, rock and roll, and pop music. Increasingly, the harmonica is finding its place in more electronically generated music, such as dance and hip-hop, as well as funk and acid jazz. It has become ingrained in the culture of the world and continues to remain popular, even in places like China and Japan, centuries after its European introduction. Most harmonicas are generally made up of the same basic parts: The comb, reed-plates, and cover-plates. 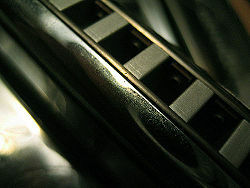 A view of part of the comb of a harmonica. The comb is the term for the main body of the instrument, which contains the air chambers that cover the reeds. The term "comb" was coined because of the similarities between simple harmonicas and a hair comb. Harmonica combs were traditionally made from wood, but now are usually made from plastic or metal. Some modern and experimental comb designs direct the air in complex, previously impossible ways. The material used for construction of the comb was, historically, believed to have an effect on the tone of the instrument. While this is true to a very slight extent, comb material has a much greater importance when it comes to durability of the instrument. In particular, a wooden comb can absorb moisture from the player's breath and contact with the tongue. This causes the comb to expand slightly, making the instrument uncomfortable to play. An even more serious problem with wood combs, especially in chromatic harmonicas (with their thin dividers between chambers) is that the combs shrink over time. Comb shrinkage can lead to cracks in the combs due to the combs being held immobile by nails, resulting in disabling leakage. Much effort is devoted by serious players to restoring wood combs and sealing leaks. Some players used to soak wooden-combed harmonicas in water to cause a slight expansion, which was intended to make the seal between the comb, reed plates, and covers more airtight. Improvements in treating the wood before production has made modern wooden-combed harmonicas less prone to swelling and contracting. One of the reed plates of a mass-produced harmonica. Note the alternating inside and outside reeds, and the difference in length of the higher pitched (shorter) and lower pitched (longer) reeds. Reed-plate is the term for a grouping of several reeds in a single housing. The reeds are usually made of brass, but steel, aluminum, and plastic are occasionally used. Individual reeds are usually riveted to the reed-plate, but they may also be welded or screwed in place. Reeds located on the inside (within the comb's air chamber) of the reed-plate produce sound in response to blowing into the harmonica's air holes, while those on the outside of the plate sound when air is drawn out through the holes. Most modern harmonicas are constructed with the reed-plates screwed or bolted to the comb or to each other. A few brands still use the traditional method of nailing the reed-plates to the comb. 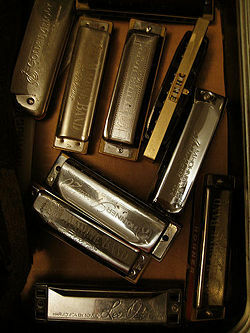 Some experimental and rare harmonicas also have had the reed-plates held in place by tension, such as the World War II-era all-American models. If the plates are bolted to the comb, the reed plates can be replaced individually. This is useful because the reeds eventually go out of tune through normal use, and certain notes of the scale can fail more quickly than others. A notable exception to the traditional reed-plate design is the all-plastic harmonicas designed by Finn Magnus in the 1950s, in which the reed and reed-plate were molded out of a single piece of plastic. The Magnus design had the reeds, reed-plates, and comb made of plastic and either molded or permanently glued together. Cover plates cover the reed-plates and are usually made of metal, though wood and plastic have also been used. The choice of these is personal—because this piece is responsible for projecting the sound and, thus, determine the tonal quality of the harmonica. There are two types of cover plates: Traditional open designs of stamped metal or plastic, which are simply there to be held, and enclosed designs (such as Hohner Meisterklasse and Super 64, Suzuki Promaster, and SCX), which offer a louder tonal quality. From these two basic types, a few modern designs have been created, such as the Hohner CBH-2016 chromatic and the Suzuki Overdrive diatonic, which have complex covers that allow for specific functions not usually available in the traditional design. It was not unusual in the late nineteenth and early twentieth centuries to see harmonicas with special features on the covers, such as bells which could be rung by pushing a button. Windsavers are one-way valves made from thin strips of plastic, knit paper, leather or teflon glued onto the reed-plate. They are typically found in chromatic harmonicas, chord harmonicas, and many octave-tuned harmonicas. Windsavers are used when two reeds share a cell and leakage through the non-playing reed would be significant. For example, when a draw note is played, the valve on the blow reed-slot is sucked shut, preventing air from leaking through the inactive blow reed. An exception to this is the recent Hohner XB-40, where valves are placed not to isolate single reeds but rather entire chambers, keeping them from being active. The mouthpiece is placed between the air chambers of the instrument and the player's mouth. This can be integral with the comb (the diatonic harmonicas, the Hohner Chrometta), part of the cover (as in Hohner's CX-12), or may be a separate unit entirely, secured by screws, which is typical of chromatics. In many harmonicas, the mouthpiece is purely an ergonomic aid designed to make playing more comfortable. However, in the traditional slider-based chromatic harmonica, it is essential to the functioning of the instrument because it provides a groove for the slide. A man uses a microphone to change the sound of a harmonica. While amplification devices are not part of the harmonica itself, since the 1950s, many blues harmonica players have amplified their instrument with microphones and tube amplifiers. One of the early innovators of this approach was Marion "Little Walter" Jacobs, who played the harmonica near a "Bullet" microphone marketed for use by radio taxi dispatchers. This gave his harmonica tone a "punchy," mid-range sound that could be heard above an electric guitar. As well, tube amplifiers produce a natural distortion when played at higher volumes, which adds body and fullness to the sound. Little Walter also cupped his hands around the instrument, tightening the air around the harp (another term used to refer to the harmonica), giving it a powerful, distorted sound, somewhat reminiscent of a saxophone. Little Walter learned most of his electrified harp playing from Big Walter ("Shakey") Horton. Harmonica players who play the instrument while performing on another instrument with their hands (such as a guitar) often use an accessory called a "neck rack" or holder to position the instrument in front of their mouth. A harmonica holder clamps the harmonica between two metal brackets which are attached to a curved loop of metal which rests on the shoulders on either side of the neck. Folk musicians and "one man bands" often use these racks. 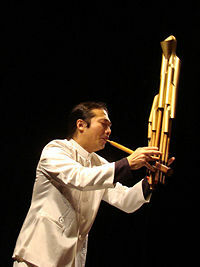 The sheng, a Chinese wind instrument with a parallel group of reeded pipes, considered a precursor of the harmonica. Some argue that the harmonica has roots in the sheng, a mouth-blown free reed instrument of ancient Chinese roots with vertical pipes, pushing its history back as far as 3000 B.C.E. However, the first documented account of the harmonica came in 1821, when Christian Friederich Buschmann, son of organ builder Johann Buschmann, registered the first European patent for a free-reeded mouth organ, which he called the "Aura." A little later, in the mid-nineteenth century, German clock maker Mathias Hohner developed the first true, recognizable harmonica. These harmonicas were exported to Hohner's cousins in America, who would then sell them to aspiring musicians. By 1867, Hohner was producing 22,000 harmonicas annually. By the late nineteenth century, harmonica production was hugely successful and big business, as harmonicas had gone from hand crafted to mass produced, and their ease of transportation made them quite popular. The late 1800s saw an American effort, from an immigrant named Richter, who developed the first diatonic harmonica, often referred to as a "blues harp"—a harmonica constructed to be played in one specific key, after which all further diatonic harmonicas have been modeled. By the 1920s, the diatonic harmonica had largely reached its modern form. Other types followed soon thereafter, including the various tremolo and octave harmonicas. New designs were still developed in the twentieth century, including the chromatic harmonica, first made by Hohner in 1924, the bass harmonica, and the chord harmonica. The harmonica was a success almost from the very start of production, and while the manufacture of quality harmonica has spread from Germany to include other countries, the output of the central German harmonica manufacturers is still very high. Major producers of harmonicas now include Germany (Seydel, Hohner—once the dominant manufacturer in the world, producing some 20 million harmonicas alone in 1920, when German manufacturing totaled over 50 million harmonicas), Japan (Suzuki, Tombo, Yamaha), China (Huang, Leo Shi, Suzuki, Hohner), and Brazil (Hering). Recently, responding to increasingly demanding performance techniques, the market for high quality instruments has grown, resulting in a resurgence of hand-crafted harmonicas catering to those wanting the best, without the compromises inherent in mass production. The harmonica has become a respected parts of almost every genre of music, from Classical to Rock to dance. Perhaps more than any other instrument, the harmonica is synonymous with "the Blues." A type of folk music predominant among African-American former slaves before finding a fanbase in white middle America, the blues were centered around the so-called "blue notes" (a note sung or played at a slightly lower pitch than that of the major scale for expressive purposes). A harmonica played in a neck rack, allowing the musician to play the guitar at the same time. Starting in the 1920s, the harmonica made its way north as workers migrated from southern states, especially to Chicago but also to Detroit, St. Louis, and New York, bringing their blues traditions along with them. The music played by the African-Americans started increasingly to use electric amplification for the guitar, blues harp, double bass, and vocals. Rice Miller, better known as Sonny Boy Williamson II, was one of the most important harmonicists of this era. Using a full blues band, he became one of the most popular acts in the South due to his daily broadcasts on the King Biscuit Hour, originating live from Helena, Arkansas. He also helped make popular the cross-harp technique, opening the possibilities of harmonica playing to new heights. This technique has now become one of the most important blues harmonica techniques. But Williamson was not the only innovator of his time. A young harmonicist by the name of Marion "Little Walter" Jacobs would completely revolutionize the instrument. He had the idea of playing the harmonica near a microphone (typically a "Bullet" microphone marketed for use by radio taxi dispatchers, giving it a "punchy" mid-range sound that can be heard above radio static, or an electric guitar). He also cupped his hands around the instrument, tightening the air around the harp, giving it a powerful, distorted sound, somewhat reminiscent of a saxophone. This technique, combined with a great virtuosity on the instrument made him arguably the most influential harmonicist of all time. Little Walter's only contender was perhaps Big Walter Horton. Relying less on the possibilities of amplification (although he made great use of it) than on sheer skill, Big Walter was the favored harmonicist of many Chicago band leaders, including Willie Dixon. He graced many record sides of Dixon's in the mid-fifties with extremely colorful solos, using the full register of his instrument as well as some chromatic harmonicas. A major reason he is less known than Little Walter is because of his taciturn personality, his inconsistency, and his incapacity for holding a band as a leader. 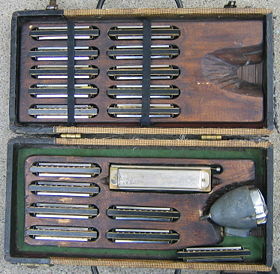 A musician's case full of harmonicas in a variety of keys, complete with a bullet microphone. Other great harmonicists have graced the Chicago blues records of the 1950s. Howlin' Wolf is often overlooked as a harp player, but his early recordings demonstrate great skill, particularly at blowing powerful riffs with the instrument. Sonny Boy Williamson II used the possibilities of hand effects to give a very talkative feel to his harp playing. A number of his compositions have also become standards in the blues world. Williamson had a powerful sound and extended his influence on the young British blues rockers in the 1960s, recording with Eric Clapton and The Yardbirds and appearing on live British television. Stevie Wonder taught himself harmonica at age 5 and plays the instrument on many of his recordings. Jimmy Reed played harmonica on most of his iconic blues shuffle recordings. The 1960s and 1970s saw the harmonica become less prominent, as the overdriven electric lead guitar became the dominant instrument for solos in blues rock. However, it still found use in the hands of artists like Paul Butterfield, James Cotton, and perhaps most prominently, Bob Dylan, known for placing his harmonicas in a brace so that he could simultaneously blow the harp and play his guitar. Recently, newer harp players have had major influence on the sound of the harmonica. Heavily influenced by the electric guitar sound, John Popper of Blues Traveler plays rapid solo lines, often with guitar effects. Tom Morello from Rage Against the Machine plays the harmonica on an electric guitar through an electronic pedal. Blackfoot, a Southern Rock band composed of mostly Native Americans, used the harmonica on a song called "Train Train," to simulate a train whistle and track. European harmonica player Philip Achille, who performs Irish, Classical, Jazz, Qawali, and Sufi music, has won jazz competitions and his classical performances have led to appearances on the BBC as well as ITV and Channel 4. In France, Nikki Gadout has become well known, and in Germany, Steve Baker and René Giessen (who played the title melody of the Winnetou movies) are well respected. The Brazilian Flávio Guimarãe performs a variety of styles. In Nashville, it is P.T. Gazell and Charlie McCoy, an American music harmonicist. In Irish circles, it is James Conway. Peter "Madcat" Ruth maintains an active website that links to the sites of contemporary players around the world. Wade Schuman, founder of the group Hazmat Modine, has fused overblowing with older traditional styles and middle European harmonies. The harmonica has found popularity in Southeast Asia, such as in China and especially Hong Kong, as well as in Taiwan and Japan, and Korea, where it is used in the elementary school music curriculum. The chromatic harmonica usually uses a button-activated sliding bar to redirect air from the hole in the mouthpiece to the selected reed-plate, although there was one design, the "Machino-Tone," which controlled airflow by means of a lever-operated movable flap on the rear of the instrument. In addition, there is a "hands-free" modification of the Hohner 270 (12-hole) in which the player shifts the tones by moving the mouthpiece up and down with the lips, leaving the hands free to play another instrument. While the Richter-tuned 10-hole chromatic is intended to be played in only one key, the 12, 14, and 16-hole models (which are tuned to equal temperament) allow the musician to play in any key desired with only one harmonica. This harp can be used for any style, including Celtic, classical, jazz, or blues (commonly in third position). Strictly speaking, "diatonic" denotes any harmonica that is designed for playing in only one key (though the standard "Richter-tuned" diatonic can be played in other keys by forcing its reeds to play tones that are not part of its basic scale). Depending on the region of the world, "diatonic harmonica" may mean either the tremolo harmonica (in East Asia) or blues harp (In Europe and North America). It was first developed in the nineteenth century by Natalie Ann Cummins. Other diatonic harmonicas include the octave harmonica. The distinguishing feature of the tremolo harmonica is that it has two reeds per note, with one slightly sharp and the other slightly flat. This provides a unique wavering or warbling sound created by the two reeds being slightly out of tune with each other and the difference in their subsequent waveforms interacting with each other (its beat). The Asian version, on which all 12 semitones can be played, is used in many East-Asian musics, from rock to pop music. There are two kinds of orchestral melody harmonica: The most common are the Horn harmonicas that are often found in East Asia. These consist of a single large comb with blow only reed-plates on the top and bottom. Each reed sits inside a single cell in the comb. One version mimics the layout of a piano or mallet instrument, with the natural notes of a C diatonic scale in the lower reed-plate and the sharps/flats in the upper reed-plate in groups of two and three holes with gaps in between like the black keys of a piano (thus, there is no E#/Fb hole nor a B#/Cb hole on the upper reed-plate). Another version has one "sharp" reed directly above its "natural" on the lower plate, with the same number of reeds on both plates. "Horn harmonicas" are available in several pitch ranges, with the lowest pitched starting two octaves below middle C and the highest beginning on middle C itself; they usually cover a two or three octave range. They are chromatic instruments and are usually played in an East Asian harmonica orchestra instead of the "push-button" chromatic harmonica that is more common in the European/American tradition. Their reeds are often larger, and the enclosing "horn" gives them a different timbre, so that they often function in place of a brass section. The other type of orchestral melodic harmonica is the Polyphonia, (though some are marked "Chromatica"). These have all twelve chromatic notes laid out on the same row. In most cases, they have both both blow and draw of the same tone. The Polyphonia is often thought to allow the easy playing of pieces such as Flight of the Bumblebee (because it is not necessary to switch airflow). The Poly was commonly used to make glissandos and other effects very easy to play—few acoustic instruments can play a chromatic glissando as fast as a Polyphonia. The chord harmonica has up to 48 chords: Major, seventh, minor, augmented and diminished for ensemble playing. It is laid out in four-note clusters, each sounding a different chord on inhaling or exhaling. Typically each hole has two reeds for each note, tuned to one octave of each other. However, less expensive models often have only one reed per note. Quite a few orchestra harmonicas are also designed to serve as both bass and chord harmonica, with bass notes next to chord groupings. There are also other chord harmonicas, such as the Chordomonica (which operates similar to a chromatic harmonica), and the junior chord harmonicas (which typically provides 6 chords). The pitch pipe is a simple specialty harmonica which is designed for providing a reference pitch to singers and other instruments. The only difference between some early pitch-pipes and harmonicas is the name of the instrument, which reflected the maker's target audience. Chromatic pitch pipes, which are used by singers and choirs, often circular in shape, give a full chromatic (12-note) octave. Specialized pitch pipes are also sold for string players, such as violinists and guitarists; these pitch pipes, usually provided with four or six individual small pipes bound together, provide the notes corresponding to the open strings for use in tuning the strings. Techniques available for the harmonica are numerous. Some are used to provide additional tonal dynamics, while others are used to increase playing ability. Using these techniques can change the harmonica from a diatonic instrument that can play one key properly into a versatile instrument. Some techniques used include: Bending, overbending, overdrawing, position playing, and vibrato. 'Vibrato' is a technique commonly used while playing the harmonica and many other instruments, notably string instruments, to give the note a "shaking" (or vibration) sound. This technique can be accomplished in a number of ways. The most common way is to change how the harmonica is held. For example, by opening and closing your hands around the harmonica very rapidly you achieve the vibrato effect. Another way is to use a 'head shaking' technique, frequently used in blues harmonica, in which the player moves the lips between two holes very quickly. This gives a quick shaking technique that is slightly more than vibrato and achieves the same aural effect on sustained notes. In addition to the nineteen notes readily available on the diatonic harmonica, players can play other notes by adjusting their embouchure (position of the lips on the instrument), forcing the reed to resonate at a different pitch. This technique is called bending, a term borrowed from guitarists, who literally "bend" a string in order to create subtle changes in pitch. "Bending" also creates the glissandos characteristic of much blues harp and country harmonica playing. Bends are essential for most blues and rock harmonica due to the soulful sounds the instrument can bring out. The famous "wail" of the blues harp typically required bending. In the 1970s, Howard Levy developed the overbending technique (also known as "overblowing" and "overdrawing.") Overbending, combined with bending, allowed players to play the entire chromatic scale. In addition to playing the diatonic harmonica in its original key, it is also possible to play it in other keys by playing in other "positions," using different keynotes. Using just the basic notes on the instrument would mean playing in a specific mode for each position. 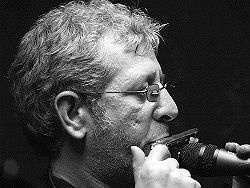 Harmonica players (especially blues players) have developed a set of terminology around different "positions" which can be somewhat confusing to other musicians. 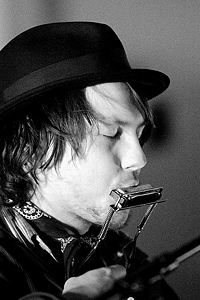 Harmonica players who amplified their instrument with microphones and tube amplifiers, such as blues harp players, also have a range of techniques which exploit the properties of the microphone and the amplifier, such as changing the way the hands are cupped around the instrument and the microphone or rhythmically breathing or chanting into the microphone while playing. A harmonica in its case. Playing the harmonica requires inhaling and exhaling strongly against resistance. This action helps develop a strong diaphragm and deep breathing using the entire lung volume. Pulmonary specialists have noted that playing the harmonica resembles the kind of exercise used to rehabilitate chronic obstructive pulmonary disease (COPD) patients such as using a inspiratory muscle trainer or the inspiratory spirometer. Learning to play a musical instrument also offers motivation in addition to the exercise component. Many pulmonary rehabilitation programs therefore have begun to incorporate the harmonica. In addition, research and teaching done by Mary Crum Scholtens, an elementary school teacher, found that teaching children to play the harmonica, mostly by ear, greatly increases their ability to sing with improved intonation. ↑ Randy F. Weinstein and William Melton, The Complete Idiot's Guide to Playing the Harmonica (Indianapolis: Alpha Books, 2002, ISBN 9780028642413). ↑ 2.0 2.1 Kim Ruehl, Harmonica, About.com. Retrieved August 15, 2008. ↑ 3.0 3.1 Harp and Blues, A Brief History of the Harmonica. Retrieved August 15, 2008. ↑ Katie Gazella, When breathing needs a tune-up, harmonica class hits all the right notes, University of Michigan, Retrieved August 15, 2008. ↑ Mary Crum Scholtens, "We've got the whole tune in our hands," Music Educators Journal, 94(2) (November 2007): 36-41. Melton, William, and Randy Weinstein. The Complete Idiot's Guide to Playing the Harmonica. Indianapolis: Alpha Books, 2002. ISBN 9780028642413. Oakley, Giles. The Devil's Music: A History of the Blues. De Capo Press, 1997. ISBN 9780306807435. Scholtens, Mary Crum. "We've got the whole tune in our hands." Music Educators Journal November 2007, 94 (2): 36-41. Harptabs.com Over 4,000 Free member provided harmonica tab - Get tabs here - Share tabs you created here! Riccardo's Harmonica Tutorial Lessons on harmonica theory, positions, scales and chord structures. More than 130 free video tutorials at YouTube.